The trouble is that there’s only about 16 useful bars of that aria, and for this kind of exercise that comes forward in multiple groups, you need at least a hundred. Most of the things I know that fit the bill are equally short, or turn out to have too many notes to keep up the necessary speed without wilting. Also, the exercise usually needs lift and movement in particular places, so I usually end up improvising – until I found this piece from Jerusalem. 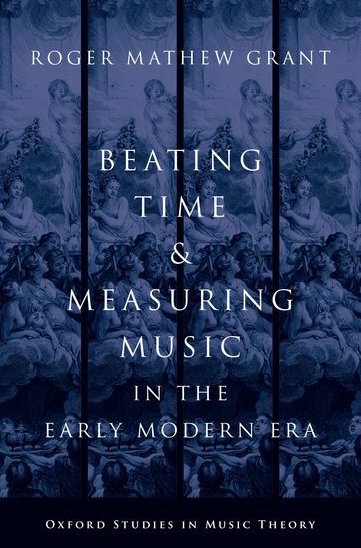 I was going to skip this in favour of something that looks more interesting on paper, but when I came to play it, it felt and sounded better as performed music than it does on the page, and it’s also very handy because it goes on for ages. Even though I can hear a score in my head by reading it, there is often – as with this piece – a chasm between what it feels and sounds like as a physical experience, and what it looks like on paper. I’m certainly influenced by just how useful this is, so maybe a normal pianist (rather than a ballet pianist) wouldn’t feel that way. What I love about this piece, the more I hear it and play it, is its constantly changing rhythmic shape. I wouldn’t have noticed this so much, or had the words to talk about it, had it not been for two instances recently where I was supposed to be teaching pianists, and learned something myself. The first occasion was in Ljublana, (photo gallery here) leading a weekend seminar for ballet teachers and pianists at the Conservatoire for Music and Ballet. A question came up about battements tendus with the accent in or out: how much does that affect the music that you should play? I wasn’t giving answers, it was a discussion between teachers and pianists. After nearly 30 years of playing for ballet, I noticed something for the first time: teachers, when they want to stress the accent in, appear to give more “accent” to the out preceding it. That figures logically, because if you want to chop a log harder, you lift it higher before it falls, and you have to show that the leg is out before it comes in on one. But it really messes with your metrical head, because you hear “accent in” as a verbal instruction, then you hear “AND a 1″ as a musical cue. Also, “accent in” doesn’t (I think) mean accent in the sense of chopping logs, but of where the close is in relation to the musical metre. So maybe this is a case for pieces that exhibit what Rothstein explains as “Franco Italian hypermeter” (see previous post) I tested the theory by playing this piece (playing card 46) which has more than half a bar anacrusis (which is one of the requirements), and asked teacher Tom Linecar-Boulton during a London Amateur Ballet class to see if it did the trick. It seems to, and it illustrates a fascinating thing about the incommensurability (in my view, at least) of musical accent with ballet accents. There’s a lightness and accentuation about this which has a very different kind of body to it than non-ballet music, and “anacrusis” in music has too many implications about downbeat that may not work for dance. What it has is a long “and,” not a heavy one, and the one has an accent which is not to do with volume or weight, but – I don’t know how to describe it – where it is. It’s like saying “I’m going to put this here, and that there,” without shouting about it. Try this (at a slow speed) for tendus with the accent in. It’s fun. This to me solves a conundrum with a certain kind of jump that jumps before the 1, yet mustn’t be heavy. 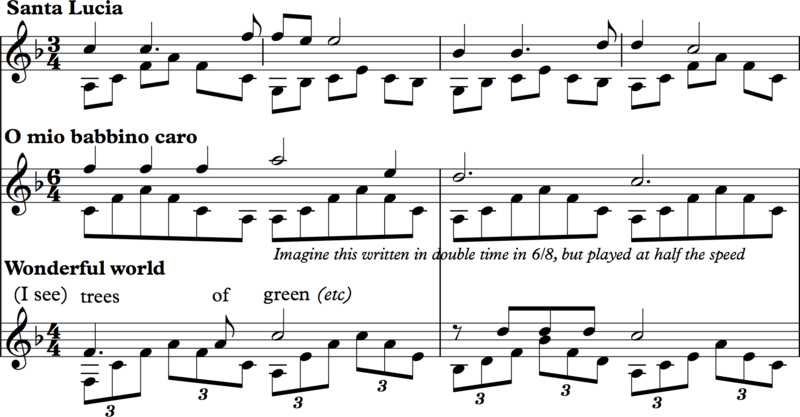 When a teacher I played for recently kept saying “a bit lighter” I thought he meant just “quicker” but I think he really did mean lighter – but in the sense of not thumping either downbeats or upbeats, but maintaining a kind of tension between the two, as in this wonderful example. You’d have to pick your moment to play this – if the dancers need the music to tell them what to do on every step, then avoid it – but if they know what they’re doing, the subtle shifts of grouping over the phrase bring all kinds of lightness and accent to it, in a way which is definitely Franco-Italian, and not German: what you have to avoid is obeying the (Germanic) rule that every downbeat has to have an accent. Think about Italian or French poetry, with its end-accented lines, and swoop over the bar lines, resisting the accents until the final bar. I can’t find a recording of this that is at a tempo which I think would work for class, so I’ve done a very rough one here – my apologies for the botched job, but I’m sight reading, and the piece has only just come out of my musical oven. Teachers, I’d love to know what you think about this, and whether I can give a name to this (is it particularly good for a certain kind of jump?). The point of posting stuff like this is not to bring back Verdi’s Jerusalem because it’s the best thing for allegro, but to offer models for either improvising or finding other repertoire, and the changes of accent, metre, phrasing, rhythm, grouping and so on in this offers all kinds of ideas. This entry was posted in A Year of Ballet Playing Cards and tagged Verdi, ballet accompaniment, ballet class, ballet class accompaniment, ballet music, free downloads, metre, sheet music on May 21, 2015 5:20 am by Jonathan Still.